"So a quantum computer sets up some qubits, applies quantum gates to entangle them and manipulate probabilities, then finally measures the outcome, collapsing superpositions to an actual sequence of 0s and 1s." 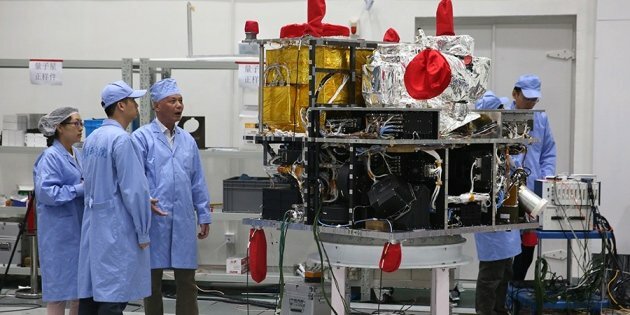 Moving mentor-student story behind China ‪Quantum Satellite. A parallel lab race evolves to collaboration. So he goes to Austria. “At their first meeting, Zeilinger asked Pan what his dream was. “To build in China a world-leading lab like yours”. Pan completes his studies and goes back to China in 2001. In the years that followed the labs of mentor and student do a parallel race. They become rivals. They then want to try satellites. Mentor approaches ESA with no luck, student approaches Chinese space agency and gets approval. But he cannot do this alone. “Ultimately, teleporting to a satellite is too big a task for any single group to do alone”. Electron buddies (Cooper pair) stick together! Keep one in Paris,take the other to Los Angeles: they'll be connected! Excerpt: "Einstein also made headlines in August when physicists presented the most convincing proof yet that two objects, such as subatomic particles, could be linked, or ‘entangled’. This would allow one particle to influence the behaviour of another, even if the two are widely separated. Researchers showed that they could produce a robust entanglement between two electrons placed 1.3 kilometres from each other. Einstein famously despised this phenomenon, which he called ‘spooky action at a distance’, because it seemingly broke the universal rule that nothing can travel faster than the speed of light. Despite Einstein’s misgivings, the approach could one day be used to build a highly secure quantum Internet that is immune to hackers." Quantum entanglement as geometric glue — this was the essence of Van Raamsdonk’s rejected paper and winning essay, and an idea that has increasingly resonated among physicists. Tensor networks, for example, are a technique developed by condensed-matter physicists to track the quantum states of huge numbers of subatomic particles. Brian Swingle was using them in this way in 2007, when he was a graduate student at the Massachusetts Institute of Technology (MIT) in Cambridge, calculating how groups of electrons interact in a solid material.